The Color management nodes are applied to convey elevation. Create color ramp: This node adds either the Moon, Earth, or Desert preset color ramp. The colors can be added, edited, and deleted in the node parameters. Apply color ramp: This node is used to link the terrain node to the Color ramp node. 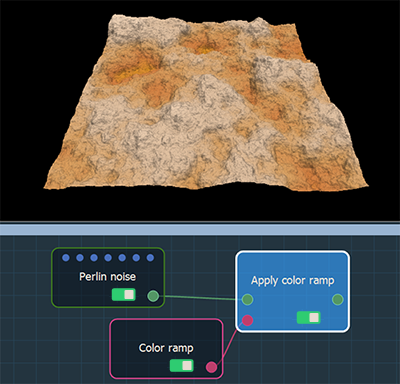 Apply Color map: This node is used to link the terrain node to the Color map node. Extract color map: This node is used to extract a color map from a terrain or a terrain composition. Convert color ramp to color map: This node takes an input terrain with a color ramp and outputs a color map. Alpha blend: This node creates an alpha composition between two color maps at locations defined by a mask. Compute normal map: This node is used to compute a normal map from a terrain or a terrain composition. See also Import color map to import a color map in the form of an image file that you can apply to a terrain generation node, a transformation node, or a composition node via the Apply color map node. See Export color map to export your color map.